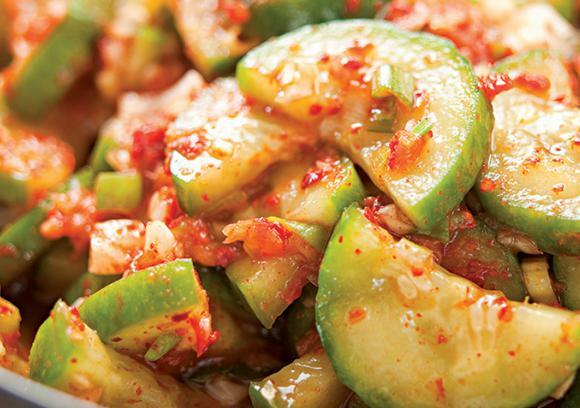 While slowly fermented cabbage and pungent garlic are the ingredients most people associate with kimchi, there are dozens and dozens of other versions of Korea’s national dish, featuring all manner of vegetables, such as these quickly pickled cucumbers with just a trace of garlic. Notes: Korean chile powder (gochugaru, gochugalu or Korean “crushed red pepper”) is made from thin red peppers that are sun-dried on woven mats or strung together and hung from the eaves of thatch-roofed houses throughout the countryside. Store, airtight, in the refrigerator or freezer indefinitely. Fish sauce is a pungent Southeast Asian condiment made from salted, fermented fish. Find it in the Asian-food section. Sodium content in fish sauce, is generally high, but may vary. The fish sauce used in this recipe contained 1,190 mg per tablespoon. Tip: A nonreactive bowl or pan—stainless-steel, enamel-coated or glass—is necessary when cooking with acidic foods, such as vinegar, to prevent the food from reacting with it.